These are the Cosmas Titan Bunker Boots embody the motto of "tradition meets innovation' as evidenced by the following testimonials. The black, 14-inch Titans are pull-on, all-leather bunker-style boots that feature a combination midsole/ladder shank that's puncture-resistant, which gives you added support and comfort but for less weight. 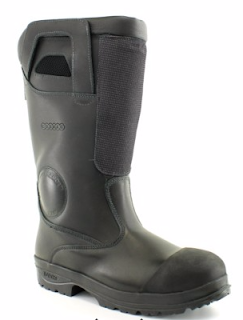 They're made of a full-grain, water-resistant leather upper, and are supported by the Ankle Armor ankle guard. For more information on the Cosmas Titan Bunker Boots, check out TheFireStore.com.